CloudExtend allows you to create events in NetSuite and attach them to NetSuite records (see here for more more info). What if you want to see your NetSuite events in Outlook? CloudExtend Outlook does not sync events from NetSuite to Outlook. NetSuite offers this functionality for free out of the box. This article borrows content from NetSuite. Click here for a link to NetSuite's article (requires login) otherwise see below. You can share your NetSuite calendar with devices and applications that support iCal format internet calendars, including iPhones, Android devices, and Microsoft Outlook. This enables you or others to view (but not edit) your current NetSuite calendar outside of the NetSuite application and does not require login credentials. First you must set up your calendar for sharing. This creates URLs that you can use to share your calendar. In your NetSuite account, go to Activities > Setup > Calendar Preference. Under Calendar Sharing, check the Public Calendar box if you want to share the events on your calendar that are public. Check the Private Calendar box if you want to share all of your calendar events. When you check these boxes, URLs are automatically generated. You can distribute these URLs to anyone you want to share your calendars with. You can reset these URLs at any time if you want to require the use of a new URL to view your calendar. After resetting these URLs, you must communicate the new URLs to those you’d like to share your calendar with. As with any Internet calendar, reminder settings on events are not supported for Google Calendar and Outlook, but they are supported on iOS devices (using iOS version 7.1.0 or later). For information on how to make your calendar events public or private by default, see Setting Calendar Preferences. To view your NetSuite calendar on an Android device, you can either use the native NetSuite for Android app, or share it with your Google calendar. For more information on the NetSuite for Android app, see NetSuite for Android Overview. 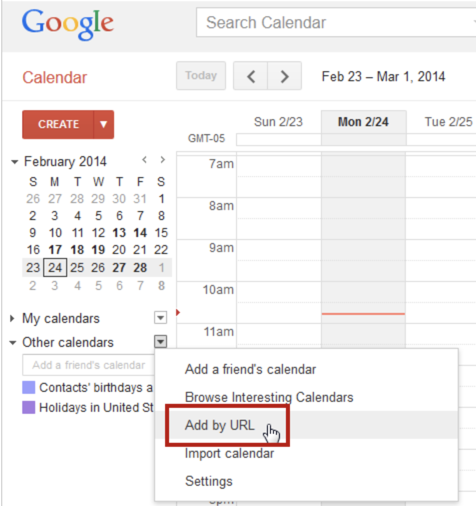 Google Calendar refreshes events from Internet calendars approximately every 24 hours. If you would like to update your calendar more frequently, you can use other Internet calendar applications. The Google Calendar Android app only supports viewing of subscribed calendars. To add a calendar, you must use the browser version of Google Calendar. In a browser, open your Google Calendar. Open the options next to Other calendars, and click Add by URL. Paste the URL generated on the Calendar Preferences page in NetSuite. To view NetSuite events in Microsoft Outlook, you can use NetSuite for Outlook, or you can add it as an Internet calendar. Select Add Calendar > From Internet. In some cases you may prefer to view your events using the Calendar application rather than logging into NetSuite. To do this you need to subscribe to the NetSuite calendar. Enter the NetSuite calendar URL from the Calendar Preferences page and then click Subscribe. Enter a name for the calendar in the Name field and choose a color from the adjacent pop-up menu. If you have an iCloud account, choose whether you want the calendar on that account.Note To view a subscription calendar in Calendar on your Mac and on devices with iOS 5 or later without resubscribing to it, choose your iCloud account. To update your copy of the calendar when changes to it are published, choose the update frequency from the Auto-refresh pop-up menu. 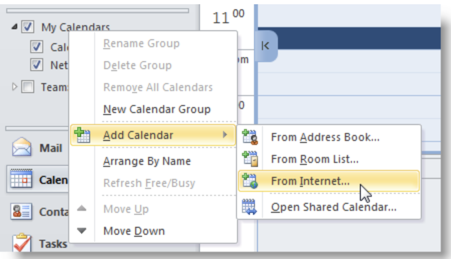 To make changes to the calendar, click the name of the calendar, and then choose Edit > Get Info. To view your NetSuite calendar on an iOS device, you can use the native NetSuite for iPhone app, or you can add it as a subscribed calendar. For more information on NetSuite for iPhone, see Overview. This is supported on iOS devices using iOS version 7.1.0 or later. Tap Accounts, then Add Account. Paste the URL generated on the Calendar Preferences page in NetSuite into the Server field. Tap Next.Important Do not enter your NetSuite user name and password. This is not required to view your NetSuite calendar on your iOS device.